CARNABY’s black cockatoos continue to visit Yanchep gardens to feed on bottlebrush plants as their natural and man-made food supplies dwindle. On Friday, November 2 the Forest Products Commission (FPC) said it planted pine trees last year for foraging for the Carnaby’s black cockatoo. FPC operations director Gavin Butcher said the commission had planted 2000ha of commercial pine plantations in the Gnangara region since 2012. “This includes 500ha of pines that were planted in 2017 to support the Carnaby’s cockatoo,’’ he said. There have been many prescribed burns carried out in the Yanchep and north of Wanneroo in the past 12 months. But Mr Butcher said the 500ha planted in 2017 had not been included in prescribed burns. 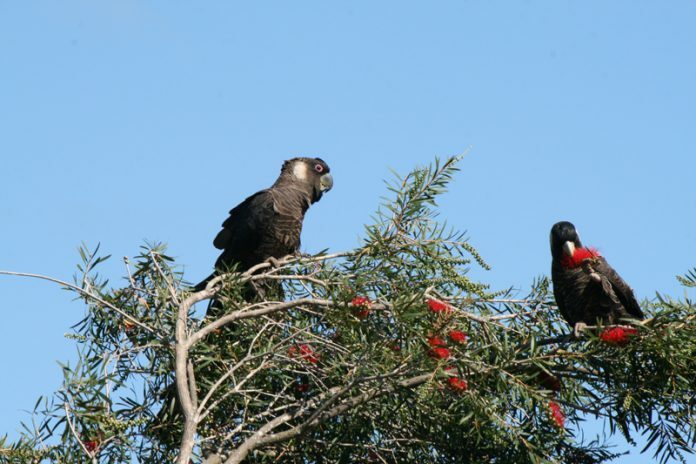 In May 2016 then treasurer Mike Nahan said $1.5 million had been allocated in the 2016-17 Budget to the Forests Products Commission for the replanting of an extra 500ha of pine trees as foraging habitat for the threatened Carnaby’s black cockatoo in the Yanchep area. He said to increase ground water recharge into the Gnangara Mound, which was Perth’s biggest groundwater resource and supplied about 30 per cent of the city’s drinking water, the state government made a decision in 1996 not to replant the pines within the Gnangara, Pinjar and Yanchep pine plantations following harvesting. “The draft Green Growth Plan for 3.5 million outlines a strategic approach to the future land use of the pine plantations, which balances a number of factors, including foraging habitat for Carnaby’s cockatoo, the demand for drinking water supply, timber supply under State Agreement obligations, future urban and industrial land use, basic raw materials supply and the health of ground water dependent ecosystems. Yanchep News Online asked the FPC if the McGowan Government had adopted this policy or something similar to provide future food supplies for the cockatoos. Mr Butcher said to refer the question to the Department of Water and Environmental Regulation. Back in 2016 the Environmental Defender’s Office WA published a 120-page white paper critical of the plan and the digital mapping and other information, released by the then state government in December 2015. Spokesman Patrick Pearlman said the EDOWA’s white paper also raised numerous concerns about how the Carnaby’s black cockatoo would be affected by clearing pine plantations northeast of Perth that made up about 50 per cent of the subpopulation’s feeding and foraging habitat, as well as the loss of “superlative” carbon dioxide-absorbing pines and other, less absorptive native woodlands on the Swan Coastal Plain. Mr Butcher said the FPC managed 8433ha of established pine plantations in the Gnangara region, across the suburbs of Yanchep, Pinjar and Gnangara.